My blog is on my project. 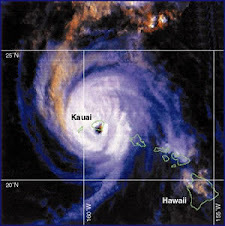 My project is on hurricane Iniki && hurricane Iwa. Which Hurricane do you like? A hurricane is a tropical storm that has winds of 119 kilometers per hour or higher. A typical hurricane is about 600 kilometers across. Hurricanes also form in the Pacific and Indian Oceans. In the western pacific oceans, hurricanes are called Typhoons. Although hurricanes may be destructive, they bring much needed rainfall to south Aisa and southeast Aisia. A typical hurricane that strikes the United States forms in the Atlantic Ocean north of the equator in August, September, or October. A hurricane begins over warm water as low-pressure area, or tropical disturbance. If a tropical disturbance grows in size and strengh, it becomes a tropical storm, which may then become a hurricane. 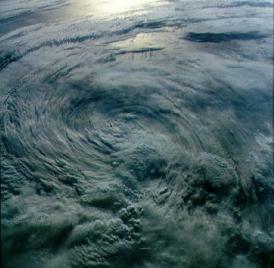 A hurricane gets its energy from the warm, humid air at the oceans surface. As this air rises and forms clouds, more air is drawn into the system. As with other areas of low pressure. Inside the Storm are bands of very high winds and heavy rains. The lowest air pressure and warmest temeratures are at the center of the hurricane. The lower air pressure at the center of a storm, the faster the winds blow toward the center. Hurricane winds maay be as strong as 320 kilometers per hour.